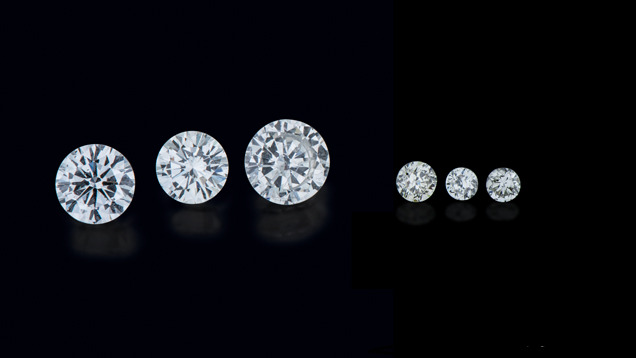 Man-made diamond producers are capable of growing all different sizes, from melee up to 10 carats or more. Typically, most commercial sizes are less than 2 carats, except for melee size, which can be abundant. • Large size (approximately 5-10 carats or more): These cut stones attract media attention, but they are quite rare and are likely to have been examined and correctly identified by a gem-testing laboratory. • Commercial size (approximately 0.25 to 2.5 carats): These cut stones are more abundant, but again, they are likely to be submitted to a gemological laboratory for evaluation where they should be recognized. • Small or melee size (approximately 0.10 carats or smaller): These cut stones are the most abundant, and because of their small size, they will be more difficult to detect and are not often tested, this is the real identification challenge facing the jewellery industry. A variety of large, commercial and melee cut man-made gemstones are available in the market. These HPHT diamonds, from left, are 0.41 ct, 0.31 ct and 0.50 ct. and three melee-sized stones.